I didn't plan well enough ahead of time to do anything particularly special for this year's Earth Day, but I figure a little recycling project and a reminder on taking care of God's Earth is good for us. Luckily, caring for our home is something we can practice every day. If you're looking for some tips on "going green," as we tend to call it these days, this article at Simple Mom may be a good place to start. The instructions for these globes can be found here at Martha Stewart. Great for old greeting/holiday cards. Happy Earth Day! If you feel like sharing how you celebrated today, I'd love to hear about it and be inspired. Thanks! These make me think of Chinese lanterns. It would be fun to use them as party decorations! oooo--that's super clever. What if you turned the strips over and then painted a flat map in blue and green! and then made the globe! exciting! ever tried it? 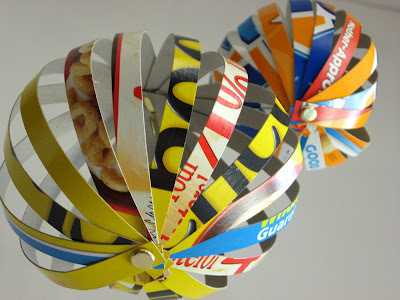 We have made a lot of these but I love your idea using the cereal boxes. Fantastic and so pretty. What a thrifty way to recycle for earth day. We will save this idea for next year! We love this craft for kids, so we shared it on our site! Thank you for sharing this awesome project! 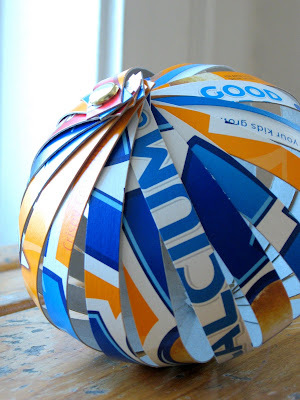 Such a great idea and I can see these making great christmas tree decorations too! Wow! This is really a very creative work of art. Thank you for sharing this. Awesome and perfect for the kids. We also did a Cereal Box Guitar out of the same materials you used. You should check this out! The cereal box globes are brilliant. We love the bright colors and the fact that this project turns something generally unwanted into something so cool and worthwhile. We recently featured this project in our blog post Easy, Durable, & Realistic Kids' Toys DIYs. About Us: We are one of the top credential clothing suppliers in the USA. We also supply mixed rags, bulk linens,, and used shoes. We work with thrift stores across the nation to keep unwanted clothing, shoes, and textiles out of landfills and into the hands of those who need it most. Quoi de neuf, bon site web que vous avez en ce moment. this is true then results might be skewed or writer may be can not draw any sensible conclusions. This site has a very interesting article, thank you for sharing.